Today, in a surprise announcement in Whitworth University’s Robinson Teaching Theatre, university trustee Scott Chandler, ’84, pledged to fund a new endowed professorship to be named in honor of his wife, Sue, ’85. 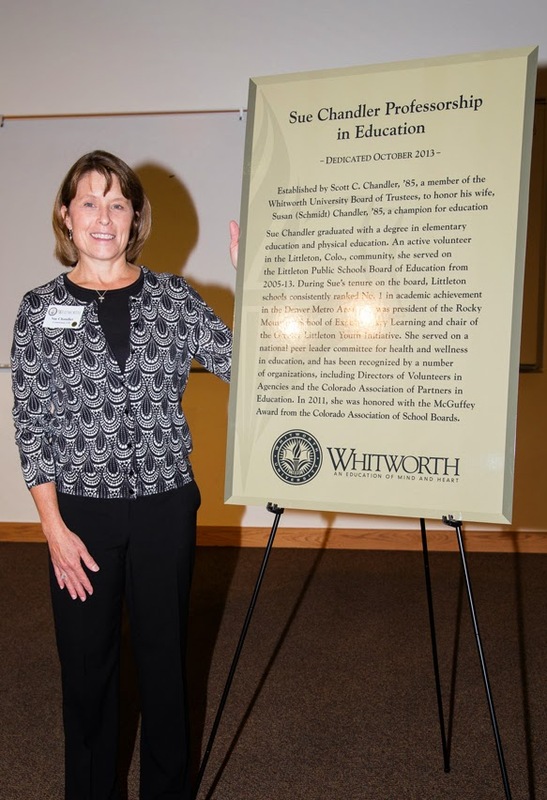 Sue Chandler, who earned her bachelor’s degree in elementary education and physical education at Whitworth, was elected and has served on the Littleton (Colo.) Public School Board since 2005. Additionally, she is the board liaison to the Rocky Mountain School of Expeditionary Learning and the Greater Littleton Youth Initiative. She is also the co-chair of the Greater Littleton Youth Initiative and has served on a National Peer Leader Committee for Health and Wellness in Education. In 2011, Sue was awarded the McGuffey Award from the Colorado Association of School Boards. She has also been recognized by a number of other organizations, including Directors of Volunteers in Agencies and Colorado Association of Partners in Education, for her years of outstanding service in education. Barbara Sanders, interim dean for the School of Education at Whitworth, says the endowment will be used in several areas in the School of Education, including increasing community-outreach efforts, advancing faculty scholarship, and supporting initiatives that improve K-12 teacher preparation. “I, and all members of the School of Education, are honored and thrilled with this generous gift,” Sanders says. Scott Chandler has been the managing partner of Franklin Court Partners, Inc., a leading boutique consulting practice. Prior to FCP, Chandler was a founder/chief financial officer and senior vice president for RHYTHMS Net Connections. He currently serves on the boards of MegaPath Networks, Purcell Systems, Cimetrix, MobilePulse, and ARCThrift Colorado, as well as on a number of advisory boards. Barbara Sanders, interim dean for the School of Education, Whitworth University, (509) 777-4303 or bsanders@whitworth.edu.